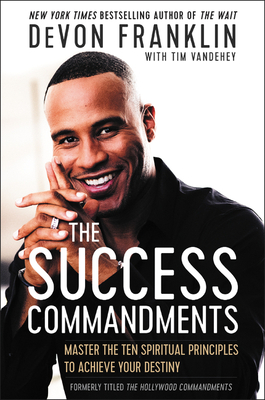 DeVon Franklin, New York Times bestselling author of The Wait and prominent Hollywood producer, reveals that secular and spiritual success are not opposites. To have one, you need the other. Are you tired of living a life paralyzed by fear? Are you anxious to break free of the “beware mentality” that has kept generations of well-meaning people living beneath the fullness of their calling? You’re unfulfilled because you’ve been convinced that you would lose your faith if you pursued the secular ambitions God has put in your heart. However, until you pursue those ambitions you will miss out on the fullness of God and the success you were created to have. For too long there’s been a line drawn between the spiritual and the secular, and we have been conditioned to believe that if we cross this line in either direction, we will have gone too far. It’s time to break down this barrier so you are free to go further than any believer has gone before. The Success Commandments combines spiritual teachings with secular strategies to help you achieve unprecedented success and live the life you were destined to live. DeVon Franklin is a bestselling author, spiritual success coach, and the CEO of Franklin Entertainment, a production company in conjunction with 20th Century Fox. He is the producer of the box office hit Miracles from Heaven and the animated film, The Star. He's Dr. Oz's go-to for spiritual success coaching on The Dr. Oz Show and he's the co-host of the TLC event series, This Is Life Live. Variety named DeVon one of the "10 Producers to Watch" and Beliefnet called him one of the "Most Influential Christians Under 40." He is the author of the New York Times bestseller, The Wait, co-written with his wife, award-winning actress Meagan Good and the best-selling Produced By Faith. — Michael Lynton, chairman of Snap, Inc.